Since launching Slapfish three years ago, chef Andrew Gruel has grown his Orange County seafood haven from two food trucks to more than 10 brick-and-mortar seafood shacks. Delicious twists on everyone's favorite food vehicle (nachos, duh) are, like this masterpiece above, further evidence that the guy knows what he's doing. 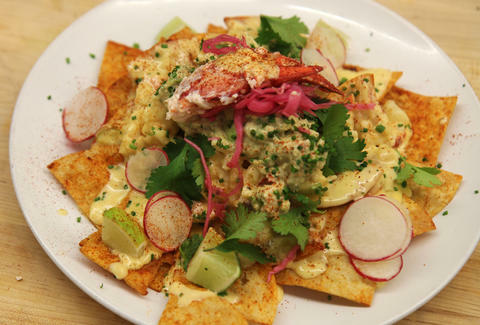 The lobster nachos he made for us haven't been added to the menu yet, but there's plenty of enthusiasm for a treat like this to become more permanent in the near future. An entire Maine lobster is used for the dish, including the non-meaty parts, which are used in the sauce. Dig into the video by Soy Nguyen.